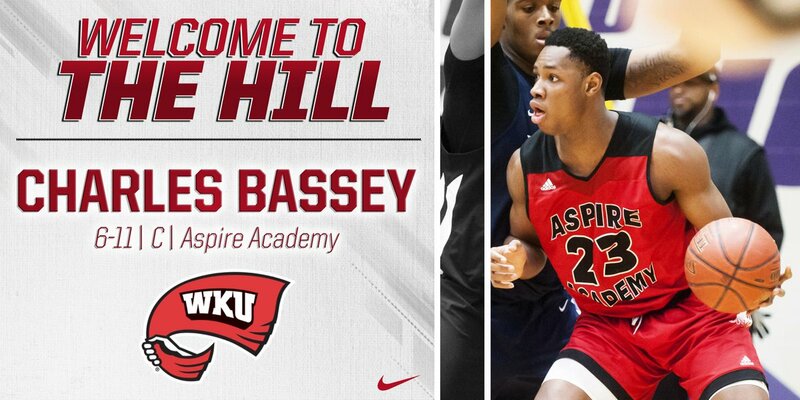 Charles Bassey, a 2019 five-star center playing for Louisville’s Aspire Academy, has committed to Western Kentucky and will reclassify to the class of 2018. Top five recruit Charles Bassey has committed to Western Kentucky and will reclassify to the 2018 class, a source tells @247Sports. Bassey chose the Hilltoppers over Kansas, UCLA, Texas A&M, LSU, and Baylor, among others. The 6-foot-11 center originally from Nigeria visited Kentucky just once last summer, but John Calipari never reached out or watched him play (exclusively) since. The Hilltopper head coach is obviously excited to have the elite prospect in Bowling Green. So yes, this guy will be playing for Western Kentucky this year. This is the second consecutive year WKU has landed a five-star prospect, with Mitchell Robinson signing with the school last year. Robinson had major eligibility issues, and his recruitment was an absolute circus. After getting on campus in Bowling Green, he then abruptly packed his bags and announced he was leaving the school. After a few weeks of absolute silence, Robinson visited the likes of New Orleans and Kansas. He then randomly re-enrolled at WKU, where he later left the school again and never returned so he could focus on training for the 2018 NBA Draft. Like Robinson, Bassey has some obvious eligibility concerns of his own, making his incredibly slow recruitment (and eventual decision) understandable. He was at the center of a custody battle/recruiting scandal in high school, with the methods of his arrival in the United States in question. International talent broker Hennssy Auriantal was hired by Bassey’s high school and later became the elite recruit’s guardian. According to the San Antonio Express-News, Bassey reportedly received improper financial benefits and “sponsorship by a charitable organization for tuition, room and board” during his transition from Nigeria to the states. As a result, Bassey was temporary declared ineligible at the high school level before eventually making a move to Aspire Academy. According to NCAA insider Peter Yannopoulos, Bassey’s guardian Hennssy Auriantal will join Stanbury’s coaching staff at WKU. Those in Bassey’s camp and coaches at Aspire believe Bassey will be eligible to play college basketball and there should be no worries about his status this season. If that’s the case, WKU got a good one. Can’t buy a kid lunch but can hire the parents to a coaching staff. No wonder Coach Cal stayed away. Speaking of a circus… I’m glad the kid got out of Nigeria, and i really hope his tag along has the right motives. He really is a good kid, foreign kids just don’t know better and there guardians use them to get money. It’s sad, really. Yeah… not sketchy at all. If he’s cleared to play, he and Taveion Hollingsworth could make some noise in C-USA.